Add more revenue to every booking with All City Savings, a new ancillary revenue product from Access Development. 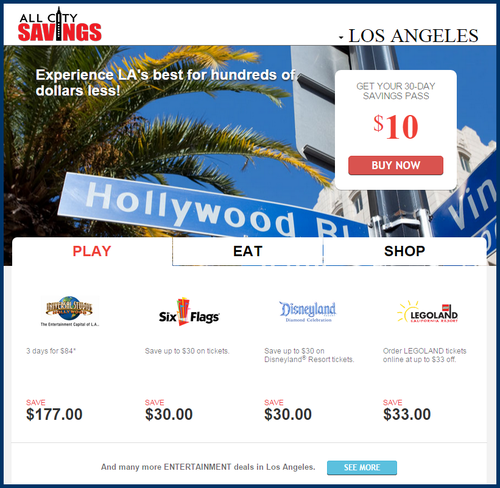 All City Savings is a simple upsell that offers destination-specific discounts on retailers, restaurants, and entertainment venues. Consumers are already looking for exciting things to do in their destination city, making their purchase of the All City Savings discount packages a no-brainer. The program offers exactly what customers are looking for: deep discounts at at everything from shopping and restaurants to theme parks and city attractions in every major market across America. Even better, implementation is as simple as dropping a link into your marketing materials. All City Savings offers a complete closed loop - we handle the processing and fulfillment, you sit back and enjoy the extra revenue while your customers save big on purchases they were already planning to make. Click here for a case study detailing how one major international airline is adding significant revenue through All City Savings.